Tyndare asks on the french mailing list how to to tag the difference between Boulanger and Boulangerie, i. e. between bakeries that make their own bread or just sell it. Jean-Baptiste Holcroft points him to a proposal that was created a while ago after a similar discussion on the tagging mailing list (automatic translation). Geofabrik added a new layer for waterway errors to their OpenStreetMap Inspector. Tony asks the Australian mailing list what to do with unauthorised bike trails in national parks. Marc Zoutendijk presents his traffic signs map on the Belgian mailing list. This starts a discussion (automatic translation) on how details of traffic signs can be tagged properly, as well on how the traffic sign database of the government might be used. Martijn van Exel puts a new Maproulette challange online to fix railway crossings across the USA. User eclass reports about his work in Djibouti. Derick Rethans is working on an improved terrace plugin for JOSM, called uberterrace. Marc Zoutendijk’s keeps on investigating and reporting about weird tagging. Baditaflorin created a map style that shows the number of revisions and tags on ways and nodes. Tordanik presents a proposal for detailed tagging of types of paving stones. Florian LAINEZ asks on the French mailing list for a simple tool to extract statistical information from the OpenStreetMap database. Example queries are the number of restaurants in France and the number of hotels in Switzerland. Taginfo is too complex. Eric Fischer updated the Mapbox tiles for tracing fromTiger 2015 data. Daniel Koć starts a discussion on the problems with the shop and amenity keys on the tagging mailing list. RasterFilters is a new plugin for JOSM that allows to run a filter on images, developed during Google Summer of Code. Chetan Gowda from Mapbox talks about 3D buildings. Example: Amba Vilas Palasts. CheckAutopista ( a quality assurance tool for motorways) launched version 2. Mateusz Konieczny coins the term trolltag for tags that contradict the definition of the main tag. Ahmed Loai Ali from the Universität Bremen presents his research project Grass & Green. Michael shows draft designs for a OpenRailwayMap logo. Pascal Neis published his OpenStreetMap Crowd Report 2015. Matthieu Gaillet is the Belgian mapper of the month. He did a lot of work on the Eurovelo 6 cycle route and the new pedestrian area in Brussels. PeeWee32 started a page to list all maps that can be used for mapping in The Netherlands. There are instructions to show the map with OpenLayers and in JOSM. He also warns that not all maps might be used to extract data. Furthermore in case data can be extracted he warns that one has to compare the date of the map with the data in OpenStreetMap before making updates. Peter Reed writes down conclusions on his analysis of retail mapping in the UK. He gives some ideas on how we can improve mapping of retail features and which tools are needed. Se Faire Connaître reacts on the mails from the French community. They describe the improvements they made to their process since the first problems in November last year, o.a. a better, manual verification instead of a fully automatic import. They now use a number of sources for POI geocoding. However, there are still a few hundred POIs that have to be repositioned with their new algorithm. They also promised to place POIs in the correct spot from the beginning (right now some POIs are added first and later placed correctly). A few days before this reaction, Philippe Verdy states that in many other cases the DWG would have been contacted to ask to block the user. Xapitoun writes that during the past two years, OpenStreetMap followed of all stages of the construction of the first viaduct in Haiti, named “le viaduc de Delmas“. Michal Migurski describes one of the methods to extract church data from OpenStreetMap. Mappa Mercia reports about the OSM London Hack weekend. Lester Caine is trying to setup a tile server to preserve the current rendering as the proposed colour scheme for roads does not look familiar for British users. Christian Quest presents a beta version of a new type of Osmose tests for missing roads based on BANO data. Pascal created a new site which shows all mappers who mapped during the last 7 days. You can browse the site by country: USA or Ecuador. The Instituto Panamericano de Geografia e Historia together with NOSOLOSIG and Geoimagina produced a lecture series about GIS. The talk from Daniel Orellana from the University of Cuenca about OSM is online. Mapbox adds running and cycling routes from Runkeeper to its mapping software. Christoph Hormann writes on the current state of glacier mapping in OpenStreetMap. Mateusz Konieczny proposes mechanical edits for surface=woodchip to surface=woodchips and surface=soil to surface=dirt on the tagging mailing list. User maning talks about a mapping party in Butuan, Agusan del Norte, Philippines. Save the Children organised an OSM training program in Dhaka. During Maptime Summercamp NL 2015 from August 17-25 people learned to use Mapbox, CartoDB and some other tools. Patrick Meier published a draft “Guidelines for Humanitarian UAV Missions” and asks for feedback. The Directions Magazin published an article “Building Knowledge with People Power & Remote Sensing“. Mhairi Ohara reported the end of the 10th round of the Outreachy Program. Interns were involved in a number of OSM projects including OpenAerialMap, the tasking manager, the export tool and LearnOSM. More information can be found on the sides of the HOT project. User maning explains why he is against an import of administrative boundaries from GADM in the Philippines. The French community discusses the import (or use in Osmose – not decided yet) of the data of OpenFlights. The license is ODbL, but not for commercial use. Someone will contact OpenFlights to see whether the license can be changed. During the discussion, another data source is mentioned: OurAirports, which is “public domain” and was imported before. They link to the licenses in the discussions, and the licenses are in English. A comparison between the 2 sources is available. Rafael Ávila Coya, an experienced imprter would like to import road network data via the Tasking Manager. The data were collected previously with GPS from the Tanzanian health service. Jotham notified the community of a successful import of wells in South Sudan. For those who find the Import Guidelines too strict, there is again an example of a poorly made import. Frederik Ramm points out that this year still a general meeting of OSMF will take place, on the part of the Executive Board is also elected. Paul Norman published the minutes of the first public sitting of the OSMF board. Appended to the protocol is an audio recording of the meeting. 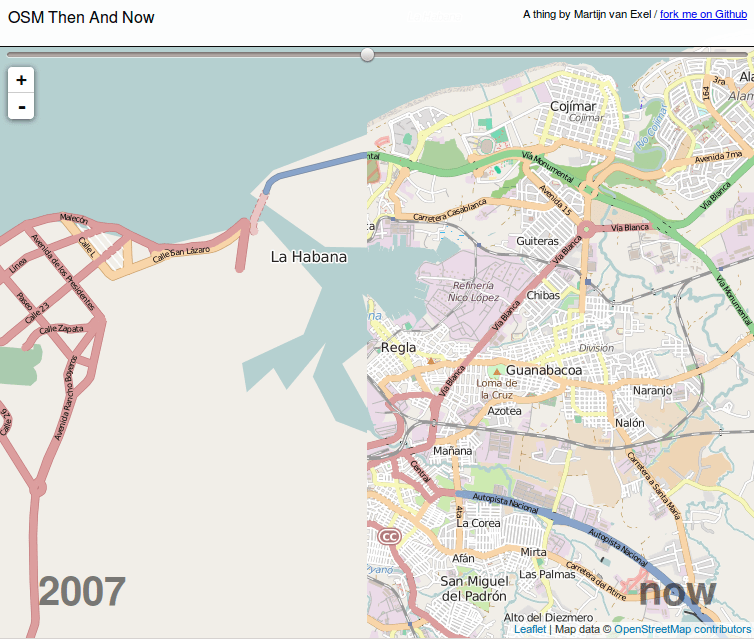 Martijn van Exel puts his then and now map back online, in time for OSM’s 11th birthday. … and here’s another new OSM-based Geo-Search Engine – Oscar. Hans Hack has built a landuse tool based on OSM data. RobJN presents (in the northern hemisphere’s Summer) the “Winter Gritting Map“. The version 2.33.0 of OpenStreetMap Carto with many new features has been released. Simultaneously started a larger discussion on trees and forests. Strava switches to a Mapbox solution, but there are lot of complaints from users on the quality of the satellite images and the loss of StreetView. An animated OSM map on economist.org shows the development of start-ups in Silicon Valley from 1995 by 2015. EventZoom now offers the possibility to represent historical events on OSM. The Ecuadorian government uses in the current outbreak of Cotopaxi Volcano a few kilometers south of Quito a number of OSM maps to inform the public of imminent threats by lahars. The maps highlight information about secure areas, medical care, shelters and escape routes. Opensource.com writes about open source map portals and data. SRTM elevation data with a resolution of one arc second have now been released for crisis regions. DataCite has provided DataCite Labs Search, a new search portal for scientific research. Mapzen reports on innovations in the routing API Valhalla. Anonymaps laments the demise of the CartoCSS style language because of changes to Mapbox Studio design. Simon Poole reports on the current development progress of Vespucci 0.9.7. Omniscale works on a map frontend for Magnacarto. Joost Schouppe reported difficulties and solutions in converting shapefiles and POLY files when multipolygons contained. TobWen asks whether the fast update of PostgreSQL was still unusable. Extracting raw GPS data from OpenStreetMap – an LGPL tool from the University of Heidelberg. Jochen Topf reports about new features and the improvements in taginfo. Tom MacWright writes about his progress at Mapbox Studio. Zool blogs of their work on a mobile app. Michael Zangl created OpenGL-View for JOSM during his GSoC project. He asks to test it. Telenav has released Wheelnav for iOS. The app will help you navigate by wheelchair. OpenSeaMap App for iOS is now available. EB Dirigo Version 1.0 released. Android 4.4 or higher is requiered – an iOS version is planned. This year’s Google Summer of Code is over. Seven of the eight OpenStreetMap projects have been successfully completed. Warm thanks to all the Students and Mentors who have taken part in the Google Summer of Code Project. .
Mapbox explains how one can deal efficiently with very large amounts of data. … the largest hedge in the world? In OSM as an attraction, but not (yet) as a hedge. … Yohours makes mapping opening hours easy. It is similar to the Opening Hours plugin for JOSM. The story of the map of France in five hexagons. Maps enter the fourth dimension, real time maps. Open Maps for Everyone gets support from Knight Prototype Fund to create an OSM-lite prototype for collaborating on that data that does not belong in OpenStreetMap. Stefan Keller announced on Twitter that GeoCSV is now fully supported by GDAL / OGR 2.1 and a QGIS plugin. The format is one of the candidates for the shapefile challenge, under which a technologically superior successor to the old shapefile format is to be found. The service called maptiks provides detailed data on the use and performance of online maps, available among others with OpenLayers and Leafletjs. The Google Earth blog explains why maps in China are displaced and what is GCJ-02. MapQuest changed its open APIs, SDKs and licenses. Alex Barth explains how Mapbox is using anonymous data from RunKeeper to improve OpenStreetMap data.